You are here: Home / Gut Health / Can Probiotics Cause SIBO? SIBO (small intestinal bacterial overgrowth) is a condition of excess bacteria in the small intestine. Can taking a probiotic make this condition worse? One study suggested yes. However, this study is very misleading. Let’s discuss an accurate summary regarding probiotics and SIBO. A rise in methane (> 20 ppm) was seen in three subjects pre-probiotic but in six subjects post-probiotic. Of the 19 subjects, an “abnormal” lactulose breath test pre-probiotic was present in ten subjects and during the probiotic, 13 were abnormal. In this one study 3 out of 19 subjects were affected. There are meta-analyses that show probiotics can treat, act against, and clean out SIBO. It is important to look at a body of evidence vs a single study. Can you react negatively to probiotics? It is possible for people to have adverse reactions to different categories of probiotics that is why it is important to try different categories to see what works best for you. See the Fast Facts or listen to this previous podcast episode for a breakdown of probiotics by category. When trying a new probiotic, it is not uncommon to experience a little turbulence as things are balancing out. Give it 3 to 5 days and if symptoms continue, that probiotic may not be for you. Dr. Michael Ruscio: Hi, this is Dr. Ruscio. Let’s discuss the question, can probiotics cause SIBO? In short, no, probiotics cannot cause SIBO. And this is not something that you should be concerned about. However, what I’d like to do is outline what could be a confusing data point in this question and provide you with some tools to help you navigate through it. So can probiotics cause SIBO? The short answer is no. We have meta-analyses which are arguably the highest level of scientific evidence showing that probiotics, in fact, can treat and act against and clean out small intestinal bacterial overgrowth in the intestinal tract. However, I have received questions asking or commenting, “I’ve heard probiotics can cause SIBO and that I shouldn’t take them.” So let’s navigate through all these bits and bites. So I’ll put the abstract up here on the screen of the study in question that’s generating some of the confusion. And unfortunately, this study has been referenced, in my opinion, very irresponsibly and has done nothing other than contribute to confusion and detract from people becoming healthier. It does not mean that people may not have negative reactions to probiotics. They’re rare. But they do happen. 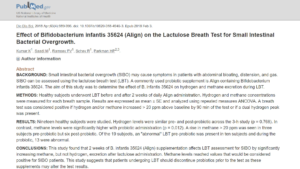 But this study entitled, “Effect of Bifidobacterium infantis (or Align Probiotic) on the Lactulose Breath Test for Small Intestinal Bacterial Overgrowth.” Let me read you a few of the details or quotes. “A rise in methane of over 20 parts per million [ppm]”—so to diagnose SIBO (or small intestinal bacterial overgrowth), we use a breath test. And a rise of over 20 would be considered a positive for bacterial overgrowth. This was seen in three subjects pre probiotic administrations, or before they administered the probiotics, but in six post probiotic. So this affected three of the 19 subjects being studied. So you took a group of essentially 19 people. 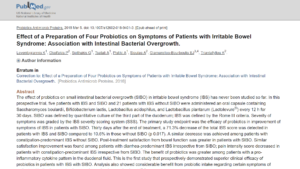 And the probiotic appeared to cause SIBO or a positive breath test in 3 people of 19 in one study. Now, you can find a study to show almost anything. This is why I’ve said several times you should not use one study to inform your decision making. You should look at what the body of evidence shows at large. So when we look at numerous clinical trials with larger numbers of people—now, we’re talking about hundreds, maybe even thousands of people—we see the overall effect of probiotics on SIBO is an anti-SIBO effect and also an anti-digestive symptom effect. And that’s where we see here. 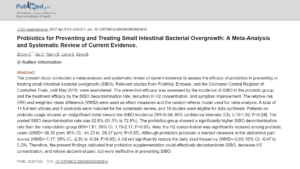 I’m linking to one systematic review and also one clinical trial showing that probiotics work better in alleviating digestive symptoms in those with SIBO compared to those without SIBO. So while one study, yes, has shown three people may obtain SIBO after using a probiotic, the overwhelming majority of data show that both probiotics can act in an anti-SIBO fashion, and probiotics can help to alleviate digestive symptoms. Now, that doesn’t mean that no one can have or will have a negative reaction to probiotics. There is a small subset of people who negatively react to probiotics. 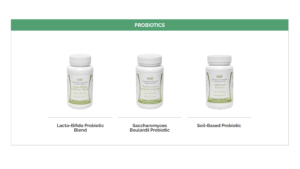 This is why in my book Healthy Gut, Healthy You I outline a 3-category system of probiotics so you can try one probiotic from each category to see what category of probiotic has benefit for your gut. And rather than just trying the litany of products out there, you can understand category 1, category 2, category 3. And you can try one probiotic from each. So it’s really important to understand that information can be miscited. And someone could, in this case, be concerned that a probiotic might be bad for their gut or bad for their SIBO because of one study and this study showing an effect—in this case, a negative effect—in three people. It’s very important to weight that against the hundreds if not thousands of people who have shown benefit from probiotics, both for SIBO and for digestive symptoms, as is summarized in systematic reviews and meta-analyses that we have available. So be cautious with what you read on the internet. And I would make sure to filter things that you hear through someone whose opinion you trust because it is important. And information used incorrectly can actually detract from your health rather than contributing to your health. So probiotics can help with SIBO. And I would have no reservation using a probiotic if you have SIBO. Of course, use your own experience and some common sense. If you take a probiotic and you notice a negative reaction that lasts more than a few days, then a probiotic may not be a good fit for you. The reason I say “more than a few days” is a little bit of turbulence for a few days as things are balancing out and your body is adjusting to a probiotic is not abnormal. So you don’t want to jump ship after a little bit of turbulence for a day. Give yourself three to five days. And if turbulence or any kind of negative symptom is still persisting after five days, up to a week, then that probiotic is likely not good for you. And try one of the other categories. All right. This is Dr. Ruscio. And hopefully, this information helps you get healthy and get back to your life. I was treated at the Cedar Sinai Gut Motility Department in L..A. for SIBO.. According to my doctor,. who follows Dr. Pimentel’s protocols, probiotics are not to be used at all. I was cured of SIBO and have been avoiding probiotics so I don’t get it back. It’s not to say probiotics are the ONLY treatment option. But, to argue that they should be avoided in SIBO is clearly going against what the preponderance of the data shows. I fear opinions like the one you are citing are preventing patients from experiencing the benefits of probiotics and instead relying on antibiotics. Does this really seem like a tenneble recommendation to you? While I understand and agree that probiotics may be helpful for some people with SIBO, I also have quite a strong opinion about it, because they literally ruined my life and my digestive system. I would advise people to be careful and if they notice any negative reaction, just stop. I don’t think we can draw any conclusions from it, but interesting nonetheless. Agreed Simas. Try probiotics and listen to your body. But also don’t not try them due to somewhat dogmatic recommendations. Hi Dr Ruscio, I have been diagnosed with IBS recently and i want to get tested for SIBO. The problem is, the breath test is not practiced where I live. Are there any other effective tests to diagnose SIBO aside from the breath test? I have used Enterogermina probiotics (a Bacillus Ckausii) 2 oral suspension per day (2 billion counts per 1 suspension), and after 3rd day, I started to have pain at top of my stomach, right below my chest. Also, the stool color turned into darkish green. Is this bad? Shall I stop? I don’t know your particular situation or history and can’t offer personalized medical advice, but typically when someone suspects they are having a reaction to a supplement, we suggest stopping to see if the symptoms go away. After that, it can be helpful to add the supplement in again to see if it was a coincidence or actually a reaction to the supplement. If a reaction to the supplement, it’s probably not working for you and you may want to find a new one. Also, this is something to discuss with your doctor. Good luck!